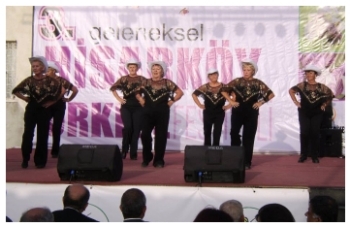 One of the popular hobbies with the expats and locals in North Cyprus is line dancing with a number of groups promoting and teaching it and this week we are looking at the Kıbrıs Liners (Kıbrıs Line Dancing Society) to find out more about them and their activities. 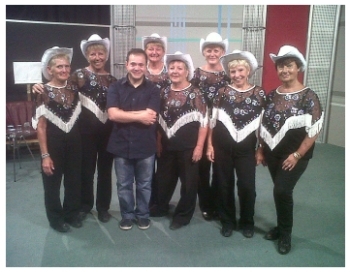 The line dance group is very active by performing at local events and helping in raising donations for charities and good causes as well as being a focal point for a very active social life with many new friendships being made, but how did it all start? We are delighted to have heard from Valerie Barrett, one of the original members, who has given us the following history from the early days. My husband Bill and I arrived in Cyprus in Feb 2002. Around March that year we went for a meal at Erols in Ozankőy and he offered us the village bar to run, we just paid Erol a rent. We did this and operated under his licence. We eventually started to get busy and my neighbour Jackie Allen came and worked for us. she was a bit worried, but said she would give it a try. So in June of 2002 she started a class up at the Paradise Hotel in Çatalkőy, and Jackie asked me to go with her on the first day, so we got her husband in to run the bar and off we went. It was great, Rose did a great job. We then met Kelly Kalfer who had a Dance Studio (not there now) just off the large roundabout as you go into Girne. We asked Kelly if we could use it for two afternoons a week and sub let it from her. She said yes and this is what we did. We stayed there for about two years. Rose had to go back to UK because her son was very ill, she wanted to close the club down, but I stepped in and said if you do that you will lose it, so I kept it open for her. just doing the dances she had taught. After a while Kelly asked us to dance at a cafe/bar near Beyti’s off Tin Pan Alley, we did this in 2005, and then she asked us to perform at the opening of the American Car wash and we did this, I think that was 2005.
of her son. In the November her son passed away. She went again for the funeral, and was away for 3 months so I was in charge and started to teach new stuff. She came back and things went back to normal for a few months. Then in Feb 2005 Rose’s husband Brian passed away. After that Rose decided to call KLDC a day and tried to close it all down. She did in theory but I decided to carry it on. By then we were using Santoria Village Studio, we rented it from them but it was not very convenient so I asked Denise Bisson if she would help me run the club and she said yes and we moved to Açmenya Restaurant in Alsancak. After a while Steve Bisson joined me to help out. and in the end we were like a partnership in the running of it. Everything went well. We carried on untill 2009 when we had our end of season social at the Dome and a few weeks later Steve said he wanted to go on his own with Denise and through that Phoenix Line Dance Club was born in August 2009. I was worried to say the least as I didn’t have enough money to lay out for new equipment etc. Then my guardian angel arrived in the form of Christine Oktekin. She paid out for the Speakers, Mixer, and Microphones we needed and out of the club we paid her back every week until it was paid up. Chrissy was my rock, she stood by me through thick and thin. We went and got registered with an advocate to make us legal, and through that route we had to become a Society so the Kibris Line Dance Society was born then. We got a good team going, and in the first year, 2007 to 2008 we did 26 shows, plus displays etc. we did our classes in various places like Golden Bay, (near to Deniz Kizi), Pine Bay, Punjab, Tolga’s, and lastly there was Simena Club Hotel, where they still are. In 2011, Bill and I decided we wanted to leave Cyprus, but we would have to leave without the dog we had rescued from KAR, Chrissy wouldn’t hear of it so we started the ball rolling and it took until March 2012 to get him a passport and make him legal. Chrissy even paid for his fare so we could get him back, her last present to us. You only have one friend in your lifetime like that and mine was Christine Oktekin. We left Cyprus on June 26th 2012 and Benji the dog followed on one week later. The KLDS has gone on and got stronger, and is getting stronger all the time, they now have a good team. As for Bill and I, we are very happy in Somerset. I work in the village shop as a paid manager, Bill and I have our own Pet Sitting service, and we are booked until 2014, and I have started another Line Dancing class here in Somerset. I am now on week 6; I started with 8 in the class and now have 17. So life is good. One day I may come back to North Cyprus for a holiday, who knows. The Kibris Liners as a registered Society were able to raise money for charity and our main charity at that time was the Karakum School for Special Needs. Every year we gave them a Christmas Party with presents and at the start of every term we bought about 500tl worth of cleaning materials. We did fundraising events for Ismail the little boy who lost his arm and we helped Lee Hickens when we could. We did sale stalls at festivals and Aҫmenya to raise money and always had raffles at our socials to raise money. For those who may be interested in line dancing, The Kibris Liners hold classes at the Simena Club Hotel from 10.30am until 12.30pm on Mondays and Tuesdays. The Monday classes are for beginners to Line Dancing and the Tuesday classes are for beginner/ improvers. The classes cost 5TL per person per class with a 10TL per year membership. We would like to give our thanks and appreciation to Valerie Barrett, Catherine Jackson, and Steve Bisson for providing us with information from which this article was written and also the pictures from their website and Facebook page and it is hoped to make additions to this history of KLDS as we establish contact with more Kibris Liners. Hi, thanks for your early reply. I was interested in knowing when your next sessions starts ? ?